They get a bad wrap for their food in the US, and I agree there is a lot of fast food and deep fried offerings, but in saying that sometimes its just grand to eat such bad food. On my recent trip to the states, hawaii to be exact, there were a few memorable meals that are really worth sharing. Firstly, pulled pork, everywhere! It’s my absolute favourite, smoky, juicy, deliciousness. Almost every day I had some kind of meal that involved pulled pork. One memorable mention was a hamburger at the cheescake factory (yes the cheescake factory, its cheesy but it is the states after all) it was a burger, with the addition of pulled pork AND coleslaw, heaven in a bun if you ask me. Another memorable meal was at the Amuse wine bar, a cool bar at the design centre where you buy a card which activates the automatic wine tasting machines. Insert your card, pick your wine, and it gives you a 20ml pour. To accompany the great wines I was tasting we had an amazing grilled cheese sandwich. Housemade french baguette, with Haviati cheese, San Daniele prosciutto (the best prosciutto you can get), truffle essence and french fries. I’m drooling just thinking about it again. And the most disgusting, fattiest, and tasty meal was a Fat Boy hotdog from Hanks Haute Dogs. The menu actually says it will kill you! A sausage (its more a sausage than a frankfurt) wrapped in bacon, AND DEEP FRIED! Served on a bun with tomato, lettuce and mayo – it has salad so that makes it healthy right?? I think I’ve put on weight just remembering these meals…. 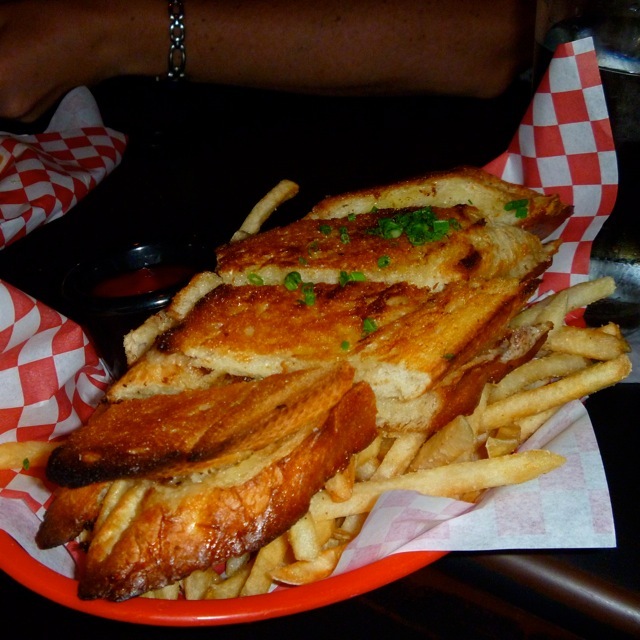 The toasted cheese sandwich from Amuse wine bar, so tasty! ← I love red wine, therefore I love the Barossa!